I have a tendency of quoting myself in talks and presentations. Maybe this is a combination of hubris, poetic licence and laziness — I could research a source for an opinion or insight. But why shouldn’t I take a different route, manufacture my own and bring something new into existence? Nonetheless, this quote from E. M. Forster has come to sit somewhere close to the centre of my professional practice. Information architecture often deals in the invisible. I make my living out of moulding and manipulating concepts, categorisation, constraints and assumptions. They’re mostly invisible building blocks. But just because they’re invisible, it doesn’t mean they’re magic. They’re definitely not inconsequential just because they’re immaterial. They’re just hard to think about. They’re hard to picture. Without a concerted effort to concretise this abstract material, it’s harder for IAs to play a substantive part in the design process and decision making. Information architecture provides the systems and structures which underpin and wrap around our designs. Information architecture implies and empowers meaning-making. We are building places using language. And without something said, and which you can look at as a team and decide whether it is what you mean, IA is often a bit of a periphery player. Naming things gives us control over them. When we leave things unsaid we lose both our ability to play with them, manipulate them, share them and shape a common understanding. Saying things is the first responsibility of an IA. Because so much of the material of my profession is invisible and immaterial (at least at the early stages of the process) I’ve always prioritised the task of making it more visible. I’ve taken the view that a bad idea is better than no idea. And that a faulty description gives us something to critique. It moves us forward from uncertainty to a greater degree of consensus — even if that consensus is simply the fact that we don’t all yet share the same view of the problem or solution. Getting IA ideas into words and pictures increases our influence. I am a fan of the Forster quote. 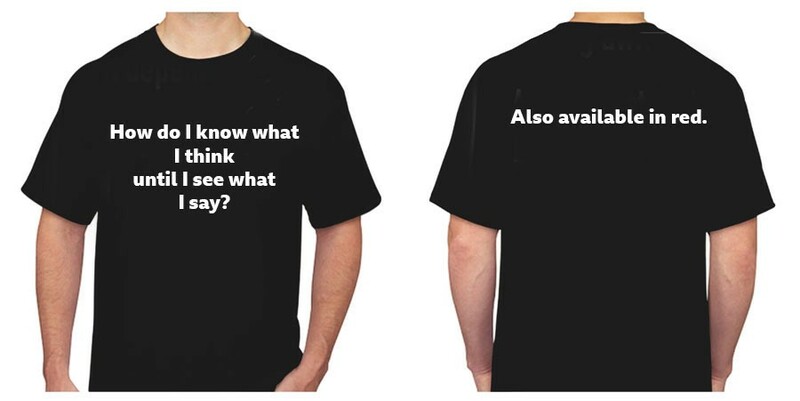 I think it could easily be among the first quotes to be added to my range of IA-related, slogan-based clothing — which is coming soon. For me, the Forster quote describes the hard-skilled edge of IA — taking thoughts and trying to constrain them with language. I sometimes think that thoughts and ideas are a bit like Harry Potter under that cloak of invisibility — they’re hard to spot and usually up to mischief. IAs are a sort of Snape-like figure — hoping to throw another cloth over the troublemaker to see the shape and impose some rules. Just like Snape, we’re sometimes misunderstood. But whenever I think of Potter and his magic cloak, I also think about that magic map of his. I like maps. Maps let you name places. They can also help you construct them. And importantly they let you relate them to a surrounding situation or context. IAs are natural placemakers — we make places out of information. And I think the second-half of the discipline, at least the way I approach it, is exploiting that skill and a degree of situational awareness to describe and shape strategy — by describing where you are and what you should do. In the past I’ve written about my ‘fish model’ as a way of understanding where you are in a project, and then using that knowledge to help decide what to do next. Each scale on the fish described a different sort of situation that you might find yourself in during a project. 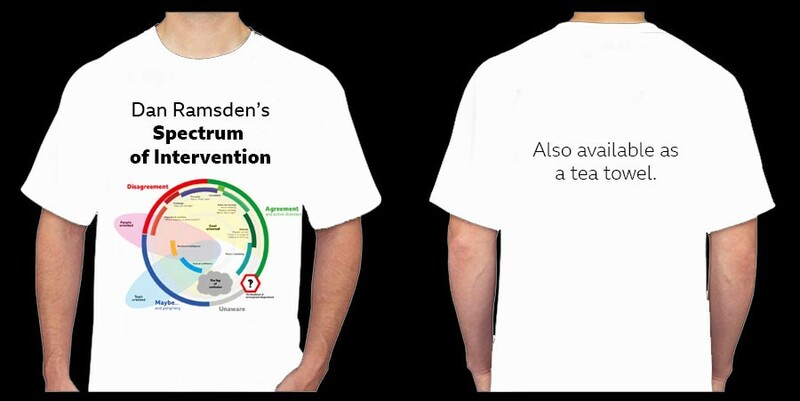 Today I thought I’d share another one of my models about situations — Dan Ramsden’s Spectrum of Intervention. I created it when I was thinking about how I get stuff done. At the start of the year I was doing lots of thinking about personal effectiveness, influence and persuasion. I wanted to visualise the different states and skillsets that I should develop and practice — and I knew these would vary depending on the situations I found myself in. The “spectrum” is an attempt to describe how I manage relationships and exert influence — and say something about the situations that matter. I know it’s a bit overwhelming. It’s in the shape of a clock. Situations and relationships can move in either direction around the face-and even jump around a bit too. But I like to keep as many relationships/situations between the 12ish to 5 o’clock-ish position. Anywhere in the green is good. This section marks agreement, where I can actively direct the situation and exert influence with lower levels of effort and engagement. In this zone I’m goal oriented. I’m probably exploiting deep levels of trust. If I’m consolidating a relationship that began in disagreement, then I’m listening and confirming we still agree. 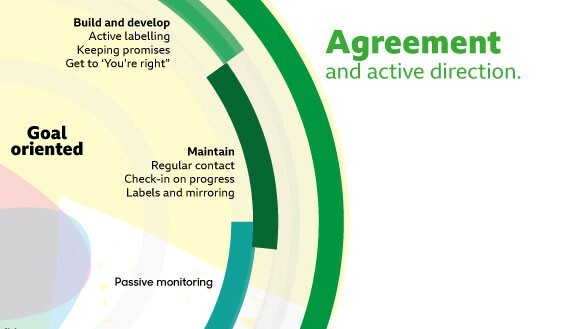 Then I’m building and developing –actively shaping the labels and language people use. I’m keeping my promises and encouraging people to actively agree with me. I might need to do some maintenance, keeping in regular contact and checking that our language, beliefs and behaviours are still on track. But for a lot of the time I can focus on delivering work, rather than working on the relationship. The section that hovers around 5 o’clock to 6 is a dangerous area — the end of office hours. I’ve probably slipped into passive monitoring and have less engagement in these relationships/situations. Here I could easily smash into the ‘Roadblock of unrecognised disagreement.’ This is where people are assuming they agree, maybe using the same words — but have different assumptions or meaning behind them. This is dangerous. You should treat the sign as a roadblock and dead-end. Use it to encourage you to regularly wander back into ‘Maintenance’ even if you have a high degree of confidence in a relationship or team. Maintenance sees you exploring language, comparing the words and labels you use — finding time to talk face to face to share and shape a common perspective. 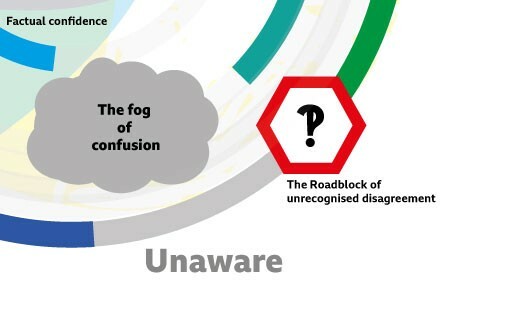 When you’re not actively developing, maintaining or looking out for relationships (pushing at the periphery) you can easily wander into ‘The fog of confusion’. I think of ‘The fog of confusion’ as containing people and situations that I don’t even know exist. There might be someone with power and influence who disagrees with me, but we’re yet to meet and realise — we might be working against each other without even realising it. Anyone in the fog doesn’t have all the information they need. It’s great when you get out of the fog backwards — where you find someone predisposed to agree with you — a nice, new ally. But often the only way out of the fog is forward into the blue zone. 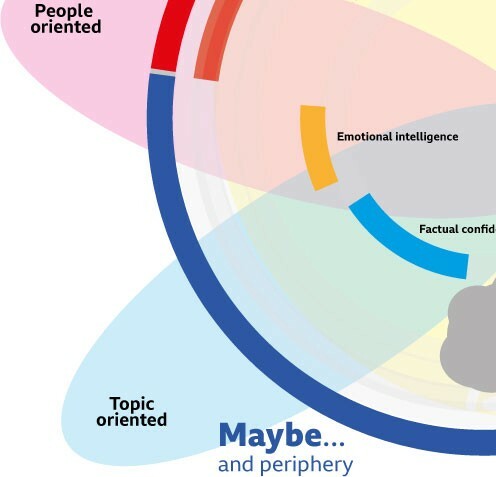 The Blue zone of ‘Maybe…’ represents the relationships and situations that you need more information about. As soon as I enter this stage I (most often) focus on facts. Developing a higher degree of factual confidence in the situation means I can start to try to exert influence, underpinned by the knowledge and my expertise. But there might be times when I need to prioritise feelings over facts. This is more likely to occur with people predisposed to disagree with me [I’m not sure why, I’m lovely]. But here, no matter how many facts I have, if I don’t try to build rapport or some understanding for the antipathy, I’m not going to get anywhere. I switch from being topic-oriented, focused on the work, to focusing on the people. I do a bit more listening than talking at this stage — it’s important to remember that listening isn’t passive. The best kind of listening is active and it can still be a form of influence to let someone talk. 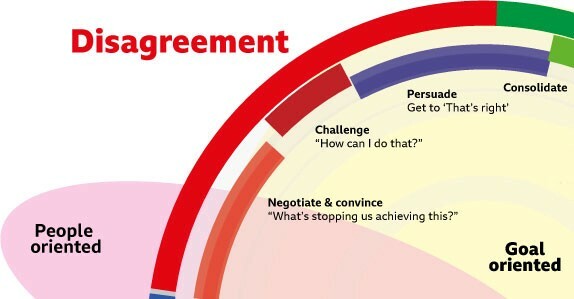 Depending on the scale of difference of opinion, I’m likely to try to use negotiation techniques. I want the other party to give me the solution to the issue of disagreement, rather than have to invent one myself. So the most powerful question in this situation is often, “What’s stopping us achieving our goal?” — that might be a specific goal or just the goal of finding a common perspective or understanding. Where we’re in serious disagreement and I have a high stake in the outcome I can directly challenge. I can still use questions to push the solution-finding to my partner. “How can I do that?” and “How can I accept / defend that?” are powerful questions to try to enforce some empathy on the other person and give them a chance to see things from my perspective. I’m trying to move them to some area of agreement. I can then work on consolidating and expanding that and then inching them over into the green zone. 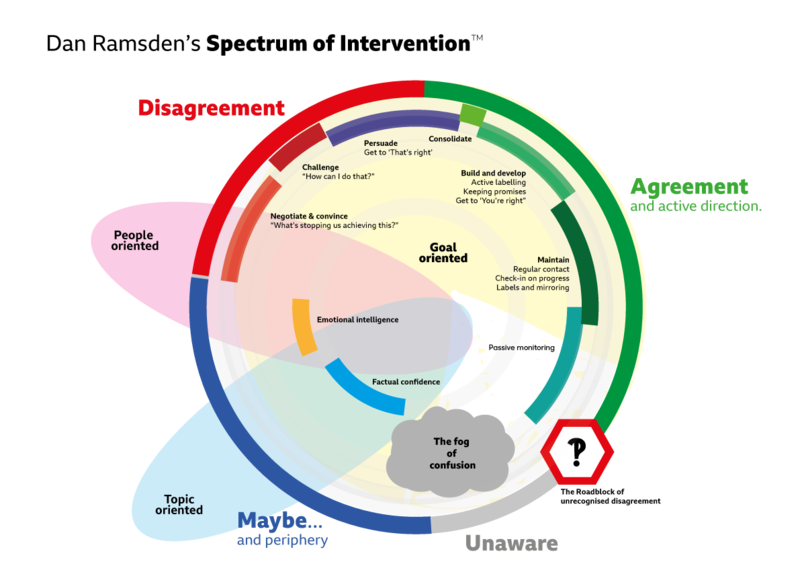 So that’s a quick overview of ‘The Spectrum of intervention’. It’s another example of how I think IAs can help shape situations by describing them. It hints at the power of adopting a more reflective practice. And it will also be appearing on a range of T-Shirts and Tea-towels soon to make their way into stores.